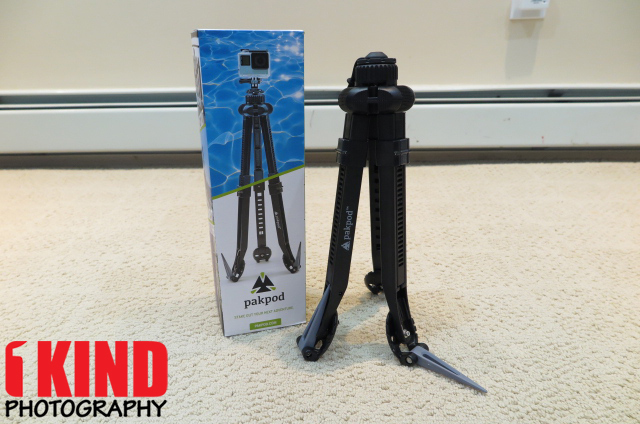 Overview : The Adventure Tripod from Pakpod is a compact, lightweight, travel-friendly tripod designed to accompany you on any outdoor adventure. 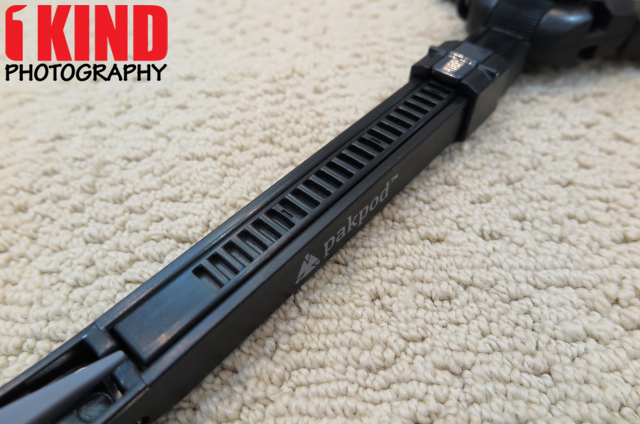 The key to the Pakpod's utility is it's ABS and stainless steel construction which keep the frame lightweight at just 15.5 oz but makes it sturdy enough to support up to 11 lb. 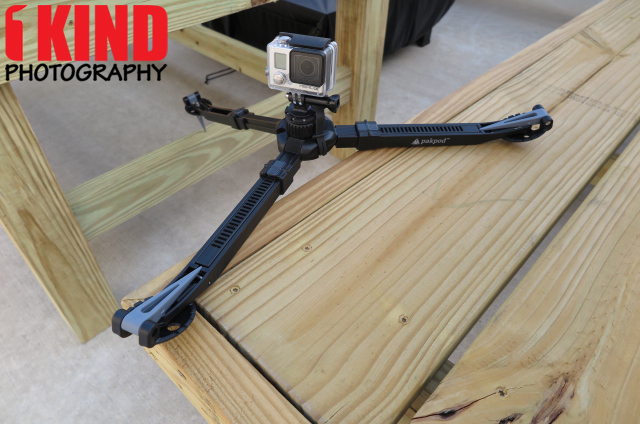 The chosen materials allow the tripod legs to bend under light pressure rather than break and make the tripod completely waterproof and rust-resistant. With a maximum height of 17.75" and a minimum working height of 1.5" the Pakpod is fairly versatile in height. 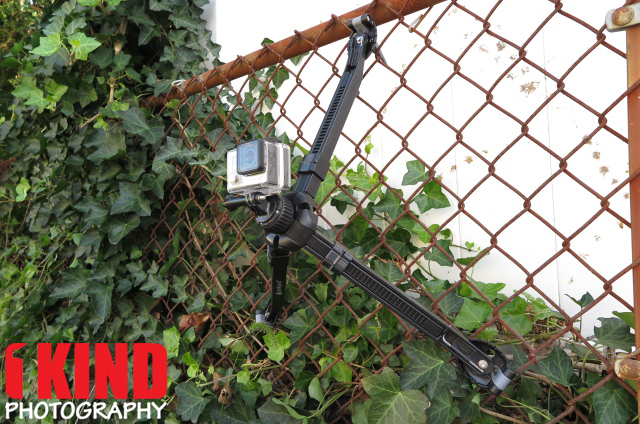 Adding to its versatility are three retractable stainless steel spikes - one at the bottom of each leg - which can be used to anchor the tripod in dirt, sand, or snow. 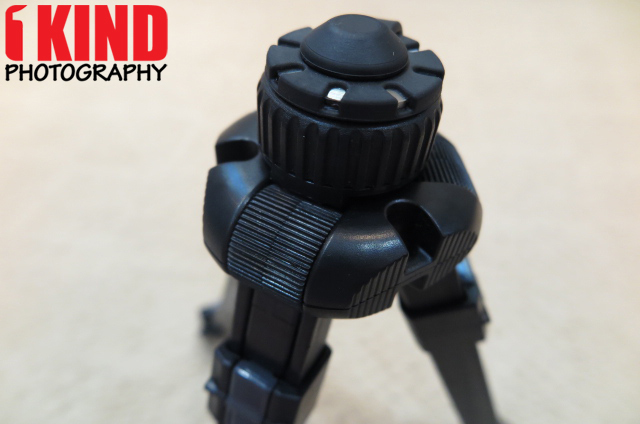 The tripod also includes a set of built-in mini tools for maintenance and adjustment in the field. Quality/Usability : A lot more new products are being launched on Kickstarter and Pakpod is one of those successfully funded campaigns. 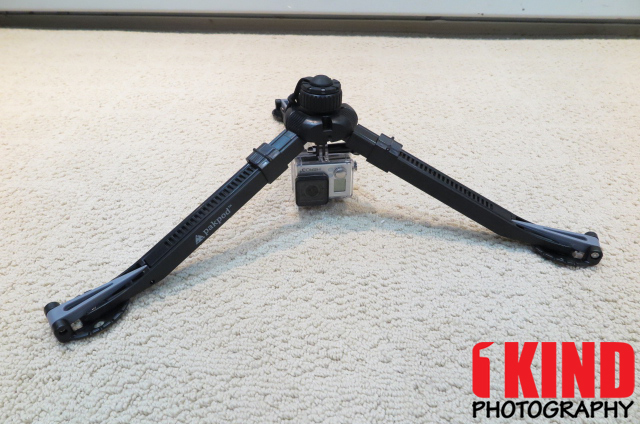 Pakpod is a lightweight, travel-friendly tripod. The Pakpod comes in a box with no pamphlets. The standard stake and tools is already attached to the Pakpod. It's pretty much ready to go the moment you take it out of the box. 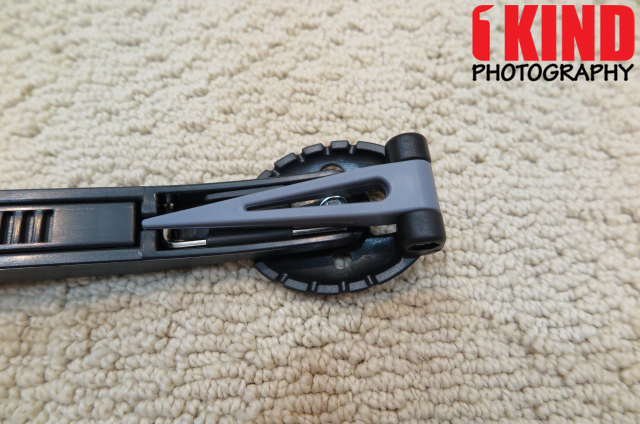 The Pakpod is mainly made from ABS plastic. Some of the hardware such as screws are from stainless steel. 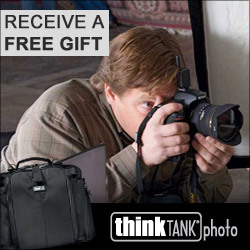 This makes it waterproof, freeze-proof and rust-resistant. The Pakpod can lay low to the ground when all legs are spread out. 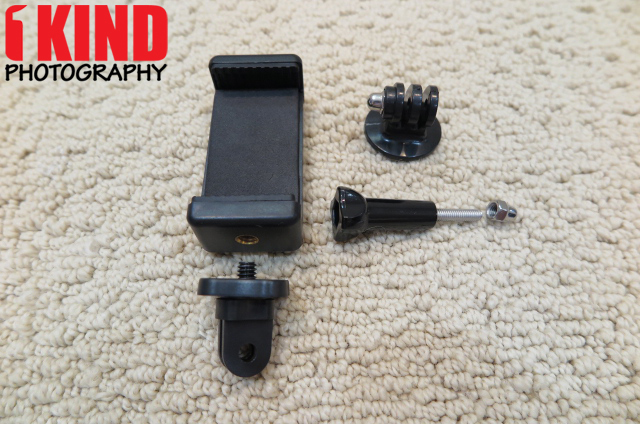 On the underside of the Pakpod is another ¼-20 screw that allows you to attach additional accessories. 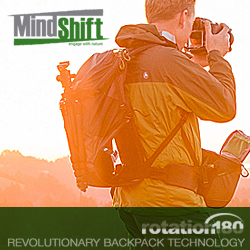 This is great if you want to get even lower shots and having your camera hang upside down. Each leg has slots. 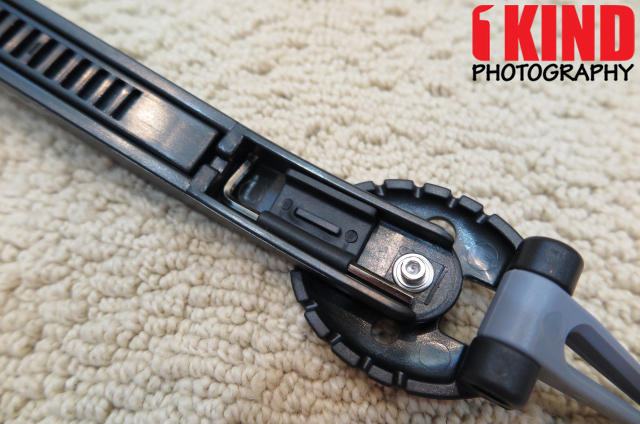 As you press on the lever, this locks into each slot, kind of like a ladder. 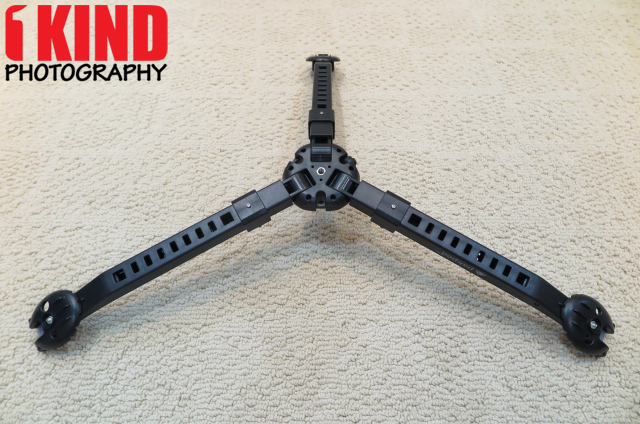 When the legs are extended, they can extend to a maximum height of 17.75". 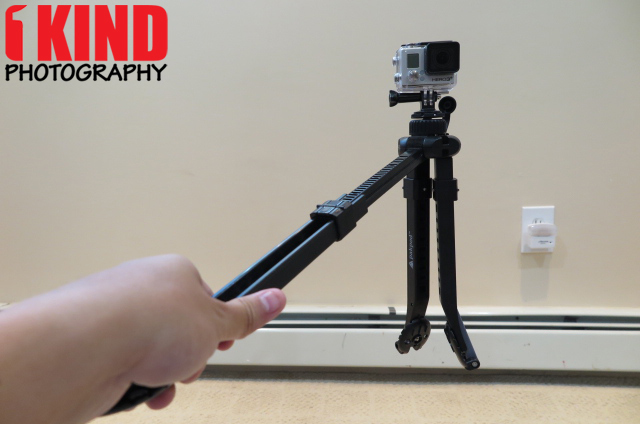 You can extended one of the legs to make it a selfie stick. The included spikes are made of plastic with a pointed tip. 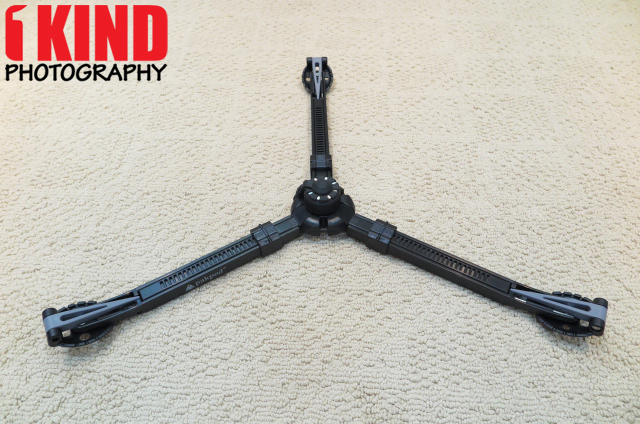 Each foot is rotatable in either direction and the spikes can be pointed either up or down depending on your setup. Sold separately are additional stakes. Eco-Green Safe Stakes (MSRP $9.00): A 3-pack of eco-green ABS plastic stakes. 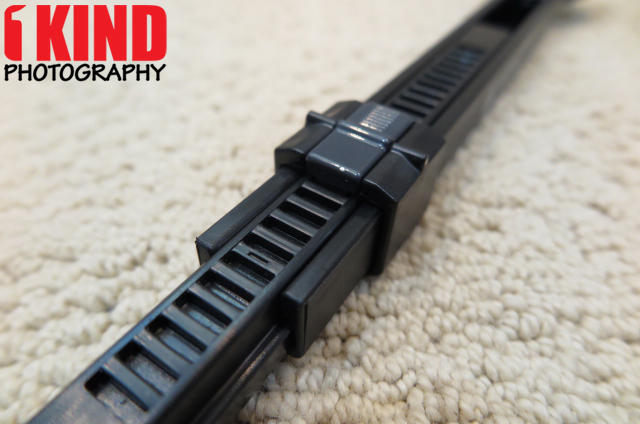 Stake Pakpod securely into soft materials like sand and snow. Safe for users of all ages. Quarter-20 Stakes (MSRP $19.00): A 3-pack of aluminum ‘Quarter-20 Stakes’ with threaded holes. 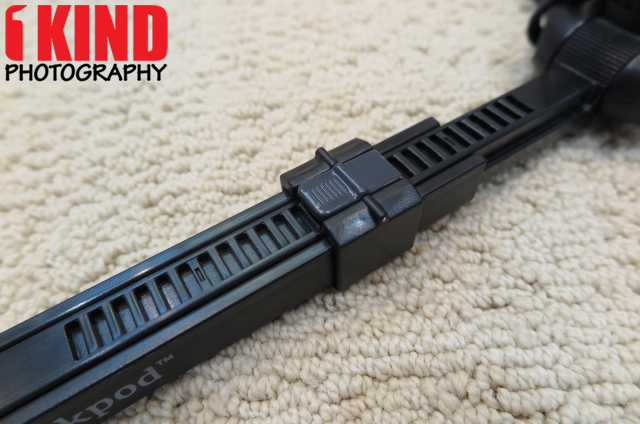 Each stake has two ‘quarter-20’ threaded holes allowing for the attachment of cameras and accessories that use a ¼-20 thread (the universal standard thread for lightweight camera accessories). On each leg, there are tools that are held in securely: two allen keys and one screwdriver. 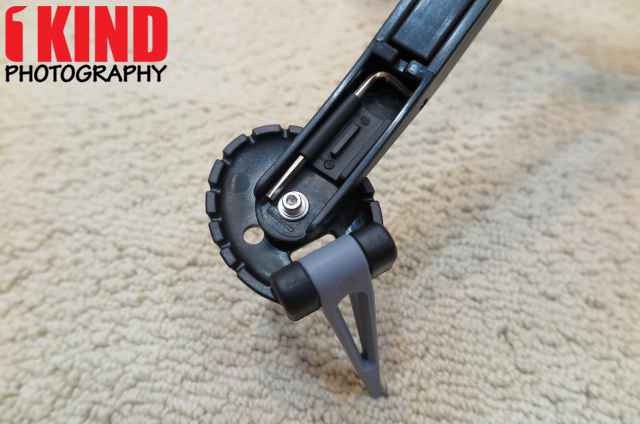 The Pakpod has a patent one-knob locking system. Although it makes it easy to lock the legs all at the same time, I found it a little frustrating. I could be adjusting two of the legs and when I go adjust the third leg, the other two has moved from its original position. 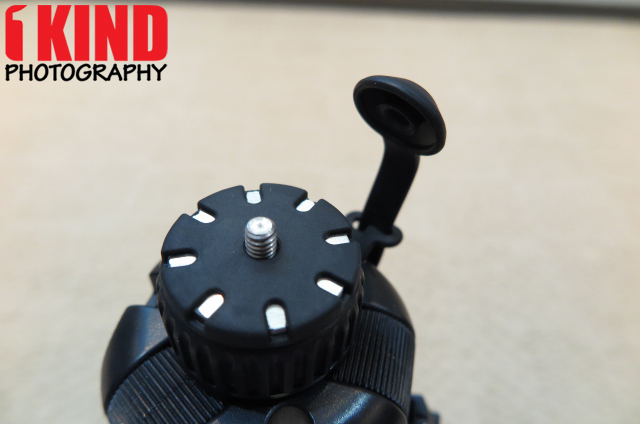 The screw is a ¼-20 thread that allows you to attach a mini ball head, mounts or even another Pakpod. The Universal Smartphone Clip needs to be enlarged. I have a 2015 Moto X Pure and the clip wasn't able to hold the phone with a case. I had to take the case off and even that was almost a tight fit. If you own a iPhone 6 Plus or 7 Plus, I don't think you'll be able to put your phone into the clip. And if you have a case on it, you definitely won't be able to fit it into the clip. I also had to off-center the phone because the clip was pushing down on my volume buttons. 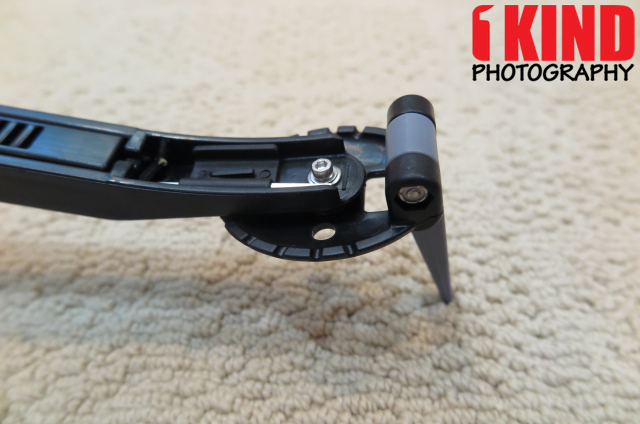 There's also a ¼-20 on top of the Universal Smartphone Clip to allow you to attach a microphone or LED light. 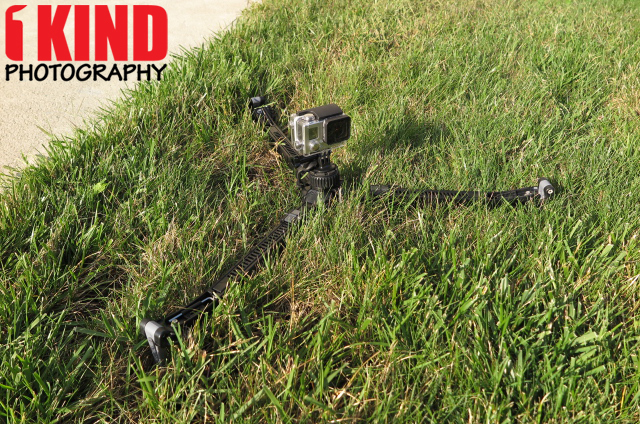 If you don't own a mini ball head [Amazon | B&H Photo | Adorama], I highly suggest getting one. They usually run for about $10-15. 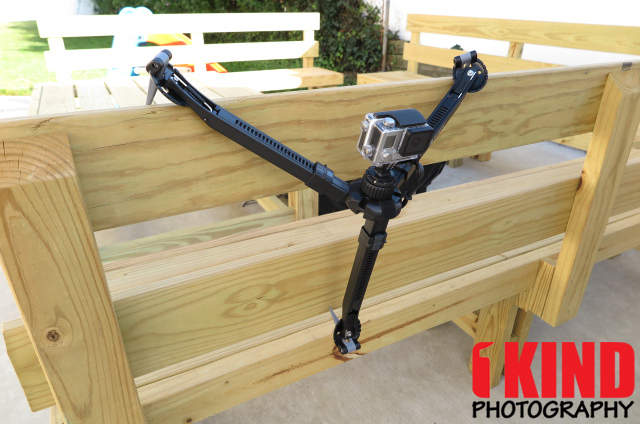 It will give you the flexibility of moving your camera at different angles. 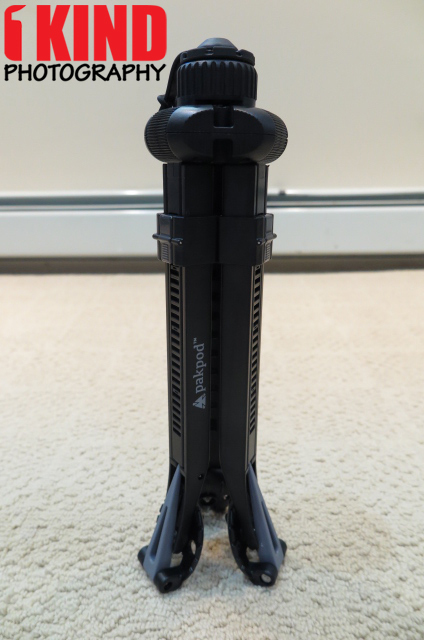 Conclusion : Overall, the Pakpod Adventure Compact Travel Tripod is a great lightweight travel tripod. 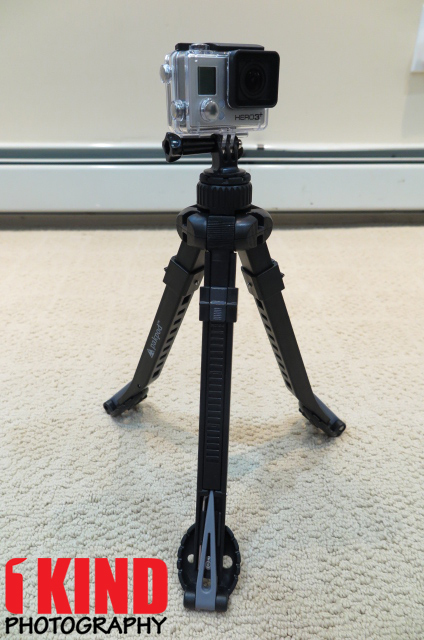 If you're an adventurer, this is a nice tripod to add to your gear. 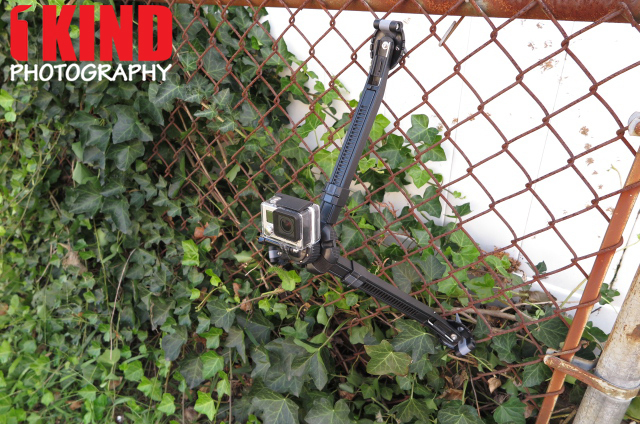 The spikes work great in securing the tripod to whatever it is. 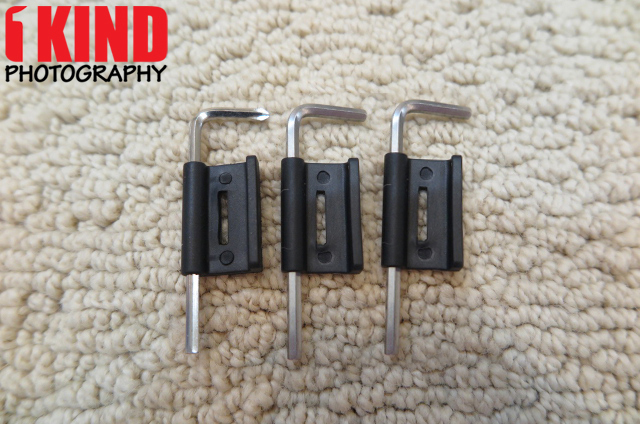 I highly suggest picking up the additional stakes as you'll be able to use bungee cords to help secure the stakes and the ¼-20 stakes allows you to attach other ¼-20 mounts. 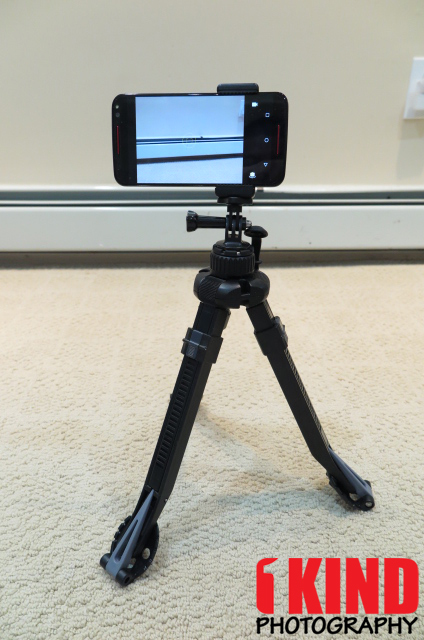 The Camera Mount Kit needs improvements in the Universal Smartphone Clip. It needs to be enlarged to accommodate larger phones especially for those who use cases. Since its made of ABS plastic, according to Pakpod's Kickstarter campaign, replacement parts will be available.